Saving the galaxy is exhausting work; these two Wookies seem to have had a very, very hard day. When I first opened my Vintage Winter kit from Swirlydoos and started examining the enclosed Bo Bunny Winter Wishes collection, I knew that I wanted to use the Flurries sheet to scrap this photo that my DIL had texted me. As I was working on my other layouts, I had visions of gears and rockets and whatnot embellishing the page; but in the end, I decided that it would work best if I were to keep it all simple, using some of the embellishments from the kit that I had left. After matting the photo with scraps, I trimmed the Prima SIIC swirl and moved it and the photo around the page until I was satisfied with the placement and glued it all down. 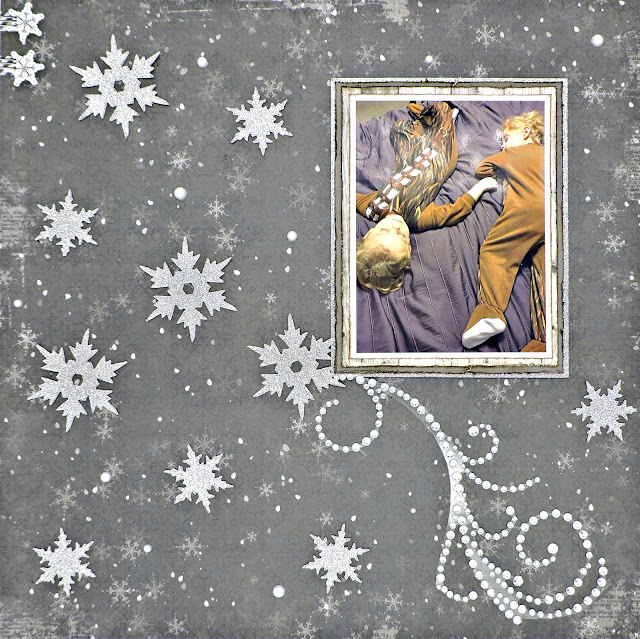 Using the Sixxiz Stacked Snowflakes Bigz L die, I cut some shapes from the Core'dinations Glitter Silk cardstock and placed them around the page. To finish, I scattered a few of the Kaisercraft self-adhesive pearls here and there to fill the empty spaces.